SUMMIT TOYS wants your opinion!!! I need your vote!! Robert's company is trying to choose which packaging to use for this toy! Please vote at the poll located to the right! I really appreciate your input and I know Summit does too!! You can click on the picture to see a bigger and more detailed image! i gotta go with a green design. even girlz know money ain't pink! 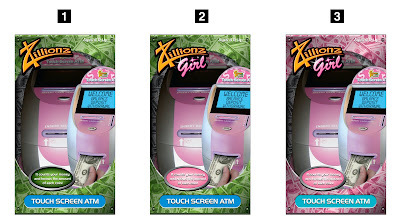 If it is supposed to be targeted for girls I think it should be the middle one but the "Touch screen atm" part should be the color of the last one!